Every year we get asked lots of questions about visiting PestEx. Before you contact us and ask a question, check our frequently asked questions list. Are you a PestEx exhibitor rather than a visitor? Check out our Exhibitor FAQs. What times does PestEx 2019 open? Who is exhibiting at PestEx 2019? PestEx exhibitors cover the width of the Pest Management industry including bird management, insect control, wildlife management, rodent control, consultancy, technology and fumigation. Take a look at our exhibitor list to plan your visit. Does PestEx have any seminars, workshops or demonstrations? Yes, there will be a range of seminars across the two days in both our business and technical seminar theatres designed to keep you updated with the latest industry news, developments and innovations. The full seminar programme will be posted in Winter 2018. Does PestEx have a showguide? If I have registered for PestEx, can I attend for more than one day? Yes, once registered your badge will allow you entry to either or both days. How can I register for PestEx? Once registered, a barcode is emailed to you before the show which will give you fast-track entry on the day. Can I register my colleagues or friends for PestEx? Absolutely. The event is free to attend, and you can bring along as many people as you like. Once you have registered yourself online, you can register a colleague or friend. I attended in PestEx 2017; will I automatically receive a badge for PestEx 2019? No. You will get an email inviting you to pre-register and will have to fill in the online form again. I'm worried that I haven't received my PestEx badge yet; what can I do? Badges will be emailed to you before the event. A reminder email and badge will be sent to you on 14 March. If you don't receive your badge by this date, it may mean you aren’t registered. Give us a call on 01332 294 288, and we can check for you. Alternatively, you can turn up on the day, and a new badge can be printed very quickly for you. Can I visit PestEx if I'm not in the pest control/management industry? Yes. Anyone with an interest in pest management is encouraged to come along, regardless of whether you work directly in the industry or not. Is there a charge for registering or attending PestEx? No. PestEx is free to attend for everyone. Is there a charge to register or attend PestEx if I register on the door? No. PestEx really is free to attend. Just bear in mind that if you don't preregister there's likely to be a queue. Do I have to provide all my personal details? We require you to fill in the mandatory fields on the registration form to enable us to provide you with your badge and information for registering. Mandatory fields are marked with an"*". There are optional fields on the form which would just be helpful for event research. I don't want to be contacted after PestEx; how can I prevent that from happening? On the registration form, you have the option of being contacted by BPCA and by exhibitors in future, which is your decision to make. Your details will be linked to the delegate badge you are wearing, and our exhibitors have scanners, so if you don’t want to share your details with them, you can just say no to being scanned on the stands while at the event. Is there a cloakroom at PestEx? There are two cloakrooms at the venue, one is in the west end of the venue on level 0 by N4/S4, and the other is in the east end of the venue on level 0. Cloakrooms are open during show hours and are chargeable at £1 per item. Please note the cloakroom is unable to take cameras, laptop equipment of other electronic devices. I am travelling a distance for PestEx, where can I stay? We have appointed an accommodation agency to manage hotel bookings for visitors and exhibitors at PestEx. Alternatively, call +44 (0)20 7870 4100 quoting MGCH19 and an advisor will be able to help you. Will there be anywhere that I can access the internet/WiFi while I'm at PestEx? ExCeL offers fast, free WiFi which is suitable for browsing, social media and email. You would need to sign in to ‘_ExCeL FREE Wi-Fi’ using a standard log-in, or via LinkedIn, Facebook or Twitter. Can I hire a wheelchair at PestEx? Free of charge wheelchairs are available to be hired from the West and East information desks at ExCeL. What is wheelchair access like at PestEx? ExCeL has been purposely designed and built to allow unrestricted access for disabled visitors, conforming with the Building Regulations Act. Will there be anywhere to buy food while I'm at PestEx? There will be a cafe in the centre of PestEx itself, as well as a wide range of food options within the main boulevard. The British Pest Control Association organises PestEx. 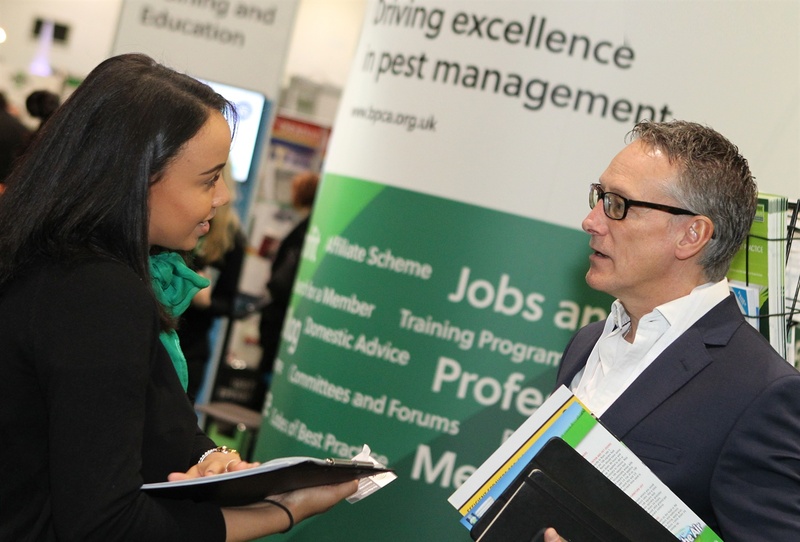 BPCA is the trade association for professional pest management in the UK. Go to our main website or come find us on our stand at PestEx if you want to find out more. Got another PestEx question that isn't answered here? If your question is about the venue, you can visit the ExCeL website. Alternatively, please call the organisers on +44 (0)1332 294 288.